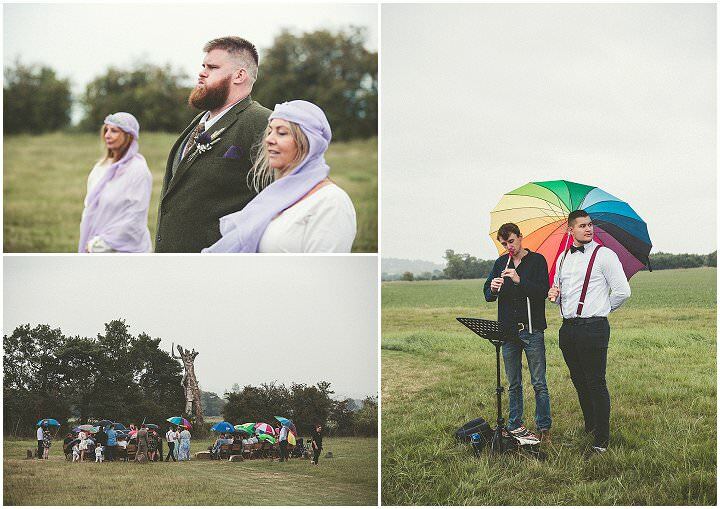 Today I have a very special wedding for you, it’s a Goddess Movement/Pagan wedding held very close to the sacred Glastonbury Tor. 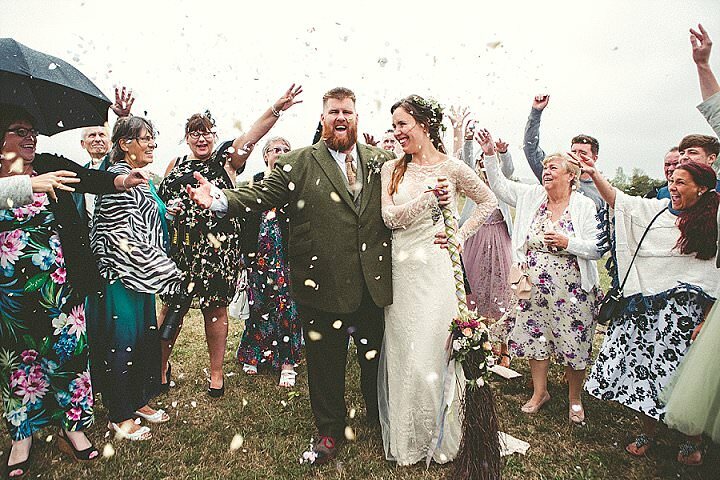 Janey and Adam wanted a wedding that really represented their individuality and their beliefs in the pagan rituals including the Hand fasting and jumping the broomstick. 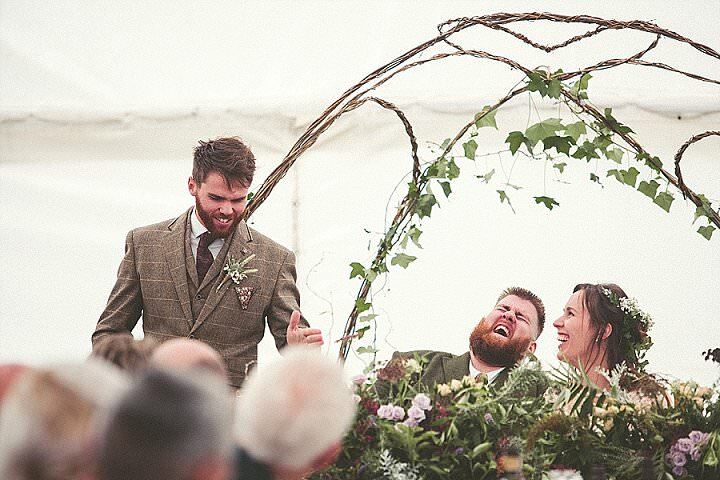 Janey is a Hedgewitch, so wanted this to be a solid feature in her day and combining the ceremony traditions, the flowers and the decoration, I believe they really pulled this off. 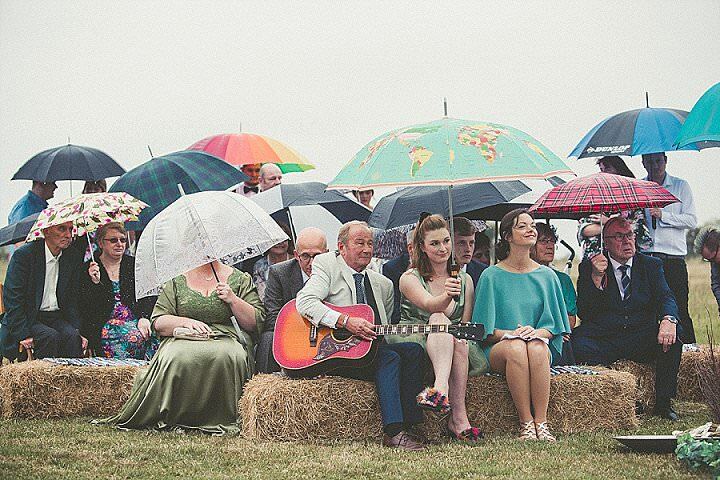 The rain didn’t dampen their spirits, infact rain at a wedding for a witch is seen as cleansing. 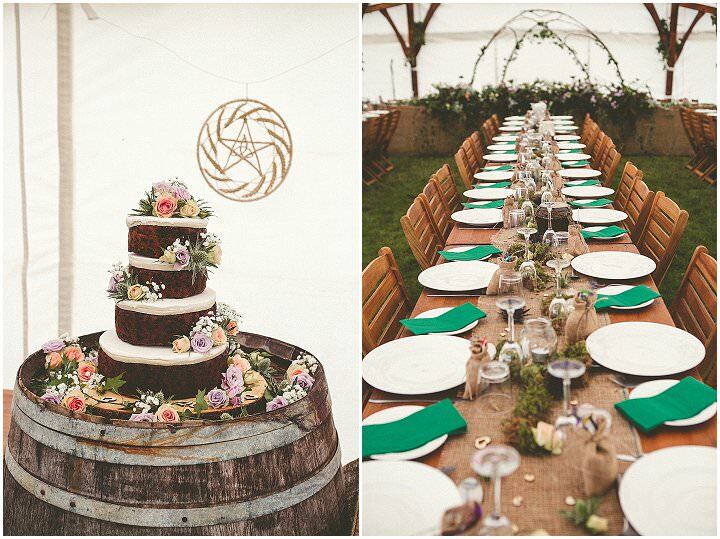 I just love the way they have decorated the marquee, so rustic and full of personality. 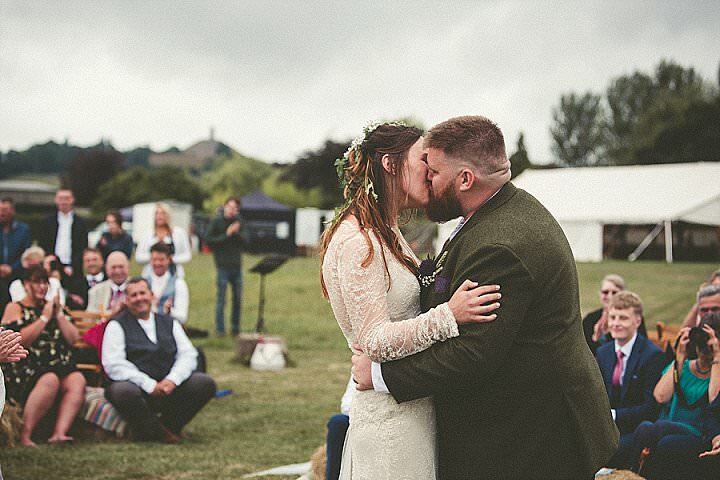 Big thanks to Emma Stoner for capturing the day and all the individual traditions so carefully. 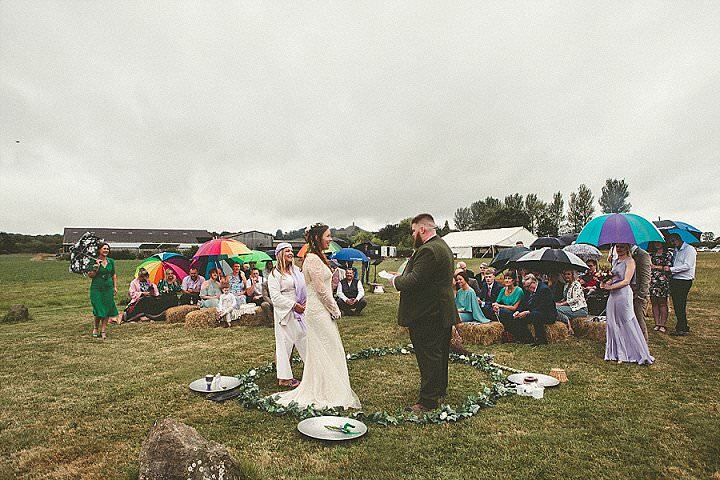 A rain-drenched celebration of love, aligned to the elements and Goddess. 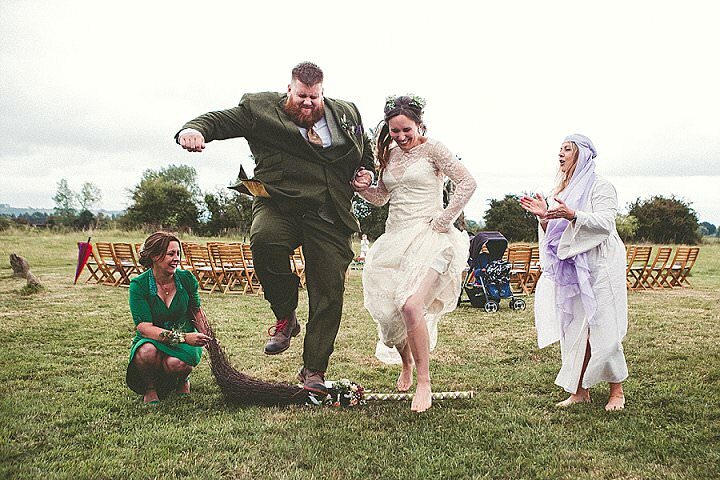 A laid-back barefoot Pagan romp, with good food and a Viking bower for a top table. 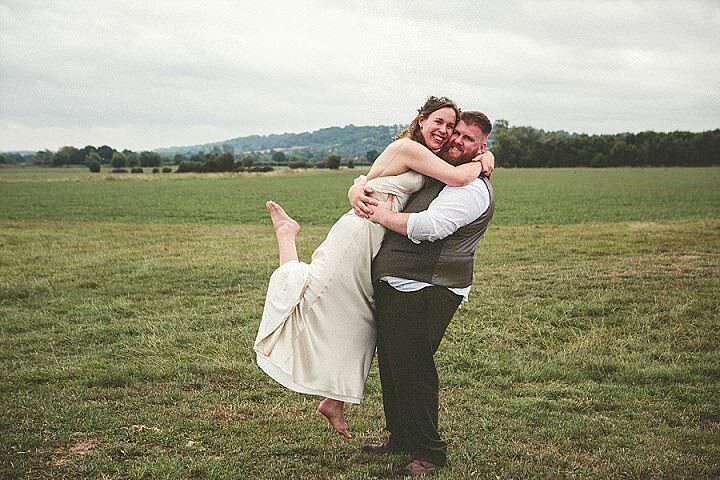 We met while both working at a cocktail bar in Bath – I was a barmaid and Adam was the doorman! We’ve been together nearly 5 years now. 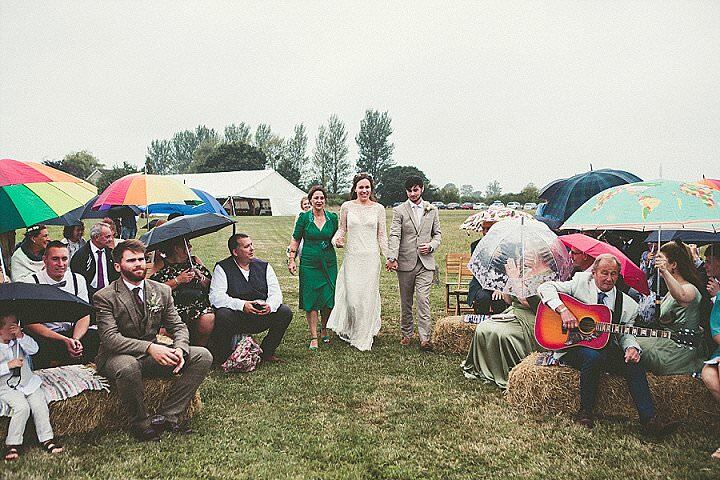 Adam proposed in a really laid-back way – I knew he was going to do it! He bought me a silver ring I liked from one of Glastonbury’s many jewellery shops (I’m not a fan of diamonds, I think they are too commercial and contribute to some pretty bad causes in the mining world). 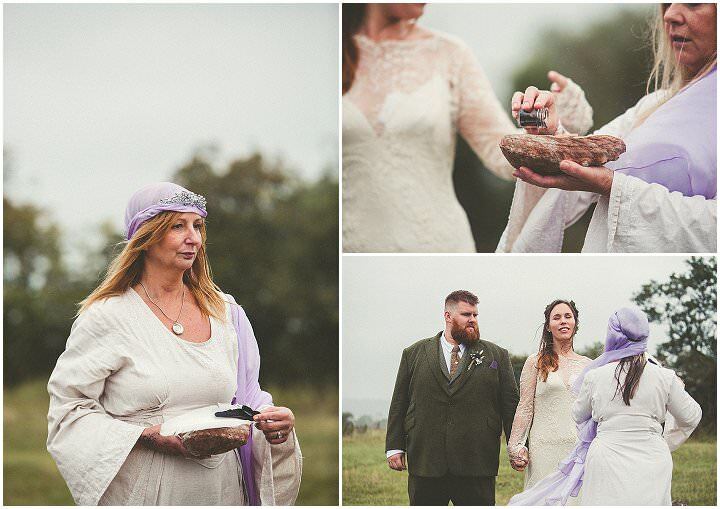 We had a ceremonial ‘smudging’ (cleansing with the use of incense smoke and feather) at Glastonbury Goddess Temple, and he got down on one knee. 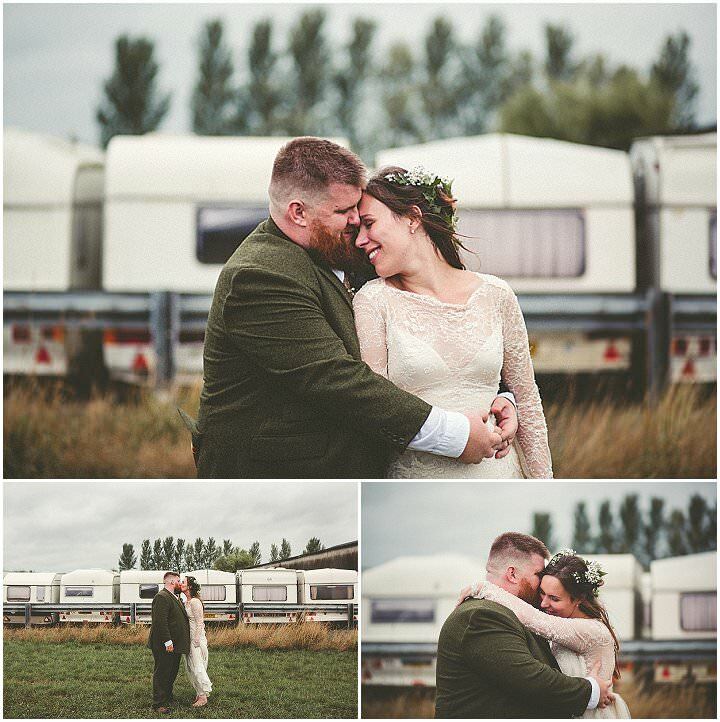 It was perfect, not too showy or grand – just right. We, of course, spent a small fortune but we allocated the bulk to the venue, our outfits and the food. 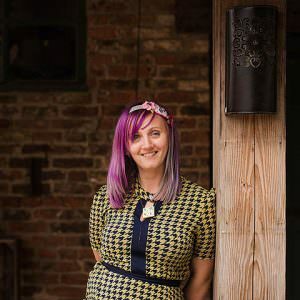 My dress – and the venue. We also honeymooned in Thailand which was a fair sprint – but absolutely amazing! 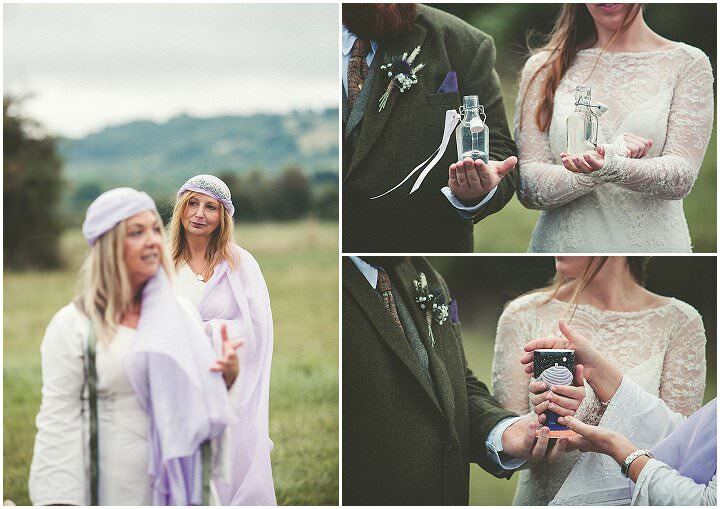 I had been trawling for photographers for weeks, I kept feeling that, from their portfolios, that many were a little too ‘straight’ to get what a Goddess Movement / Pagan wedding is all about. There are more miniscule moments to catch than in a typical church outing. The binding of the hands is one small part, there is also the invocation of the elements using fire, air, earth and water. 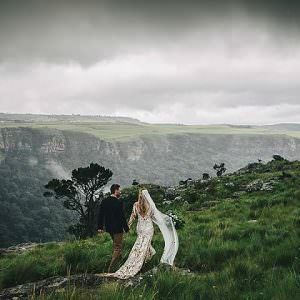 Emma Stoner has a certain power as a photographer which means, all biases aside, she transcends the standard wedding photographers out there. 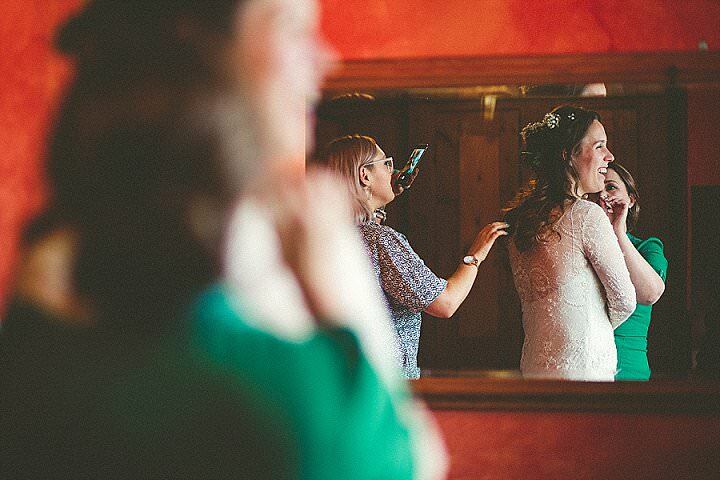 She is more than a wedding photographer- she captures every little smile, every grin, every tear and even the tiny things you often miss that make you tear up – at mine and Adam’s Handfasting she captured the beauty in every lost shoe, a wooden sword, an ashtray, a stray flower, a nervous laugh or even a bit of stress when something goes a little stray from the plan. In short, she will flit around like a dragonfly, disappearing and re-emerging, catching every sparkle you may want. That is the power of Emma Stoner – she just gets it. Her photography is special. 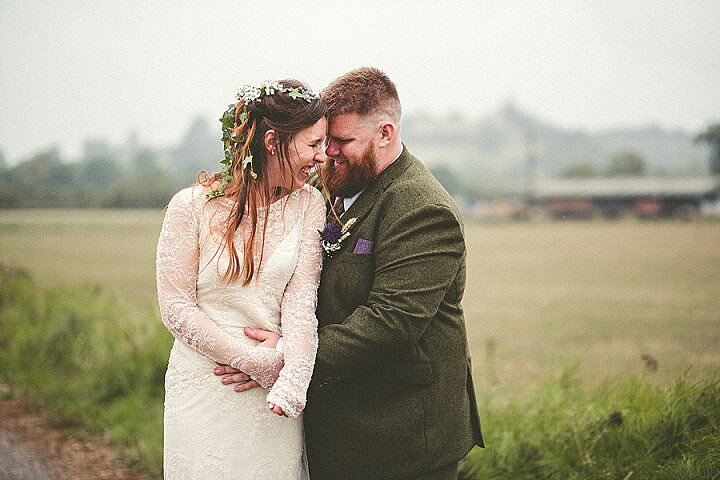 My dress was ‘Celeste’ by David Fielden – it was bought and fitted at Carina Baverstock Couture in Bradford-on-Avon. It was a stone colour and had a sort of shimmer every time I moved. It featured a lace overlay with a satin under-piece. The sleeves were intentionally kept long to mimic those slouchy jumpers I love and wear to keep it looking relaxed / glamour. I wanted ‘sophisticated white witch’ and I think it delivered. 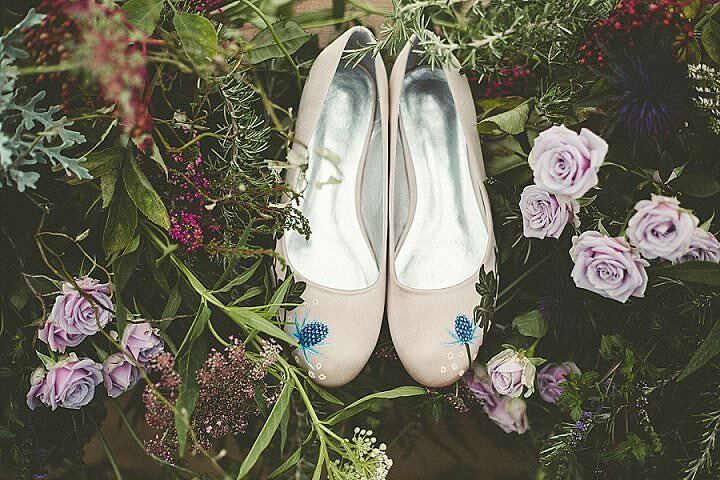 My shoes were pumps from Elizabeth Rose – they featured the thistle and ivy motifs from our flower arrangements. Later in the evening, I wore my Great Grandmother’s pearl necklace paired with the satin slip underneath. 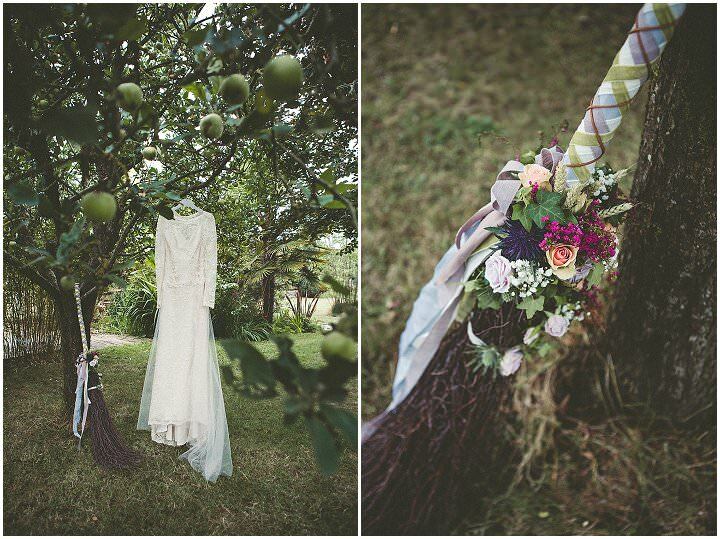 I opted out of the traditional bouquet – I had a gorgeous bespoke floral broomstick or ‘besom’ which Adam and I leapt over into domestic bliss together. 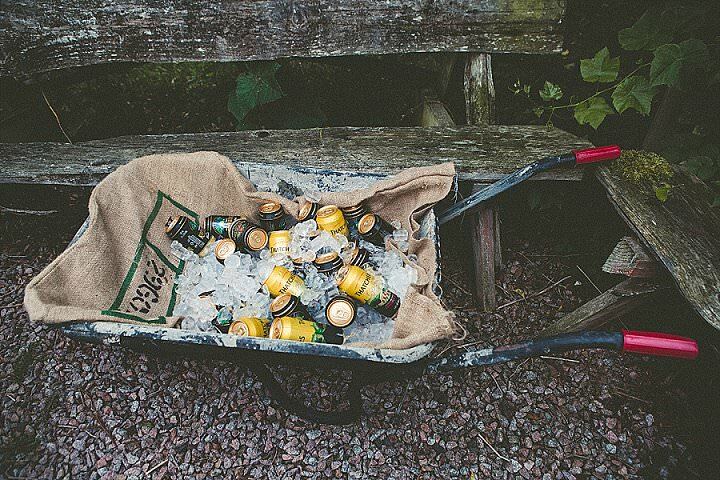 It went everywhere with me all day and I could often be seen trying to fly on it. 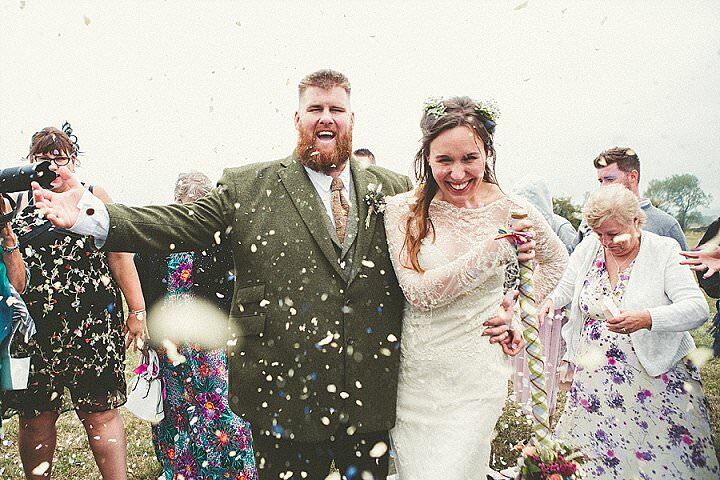 Adam wore a forest green tweed suit tailored at Clifton Suits in Bristol where we lived back then. 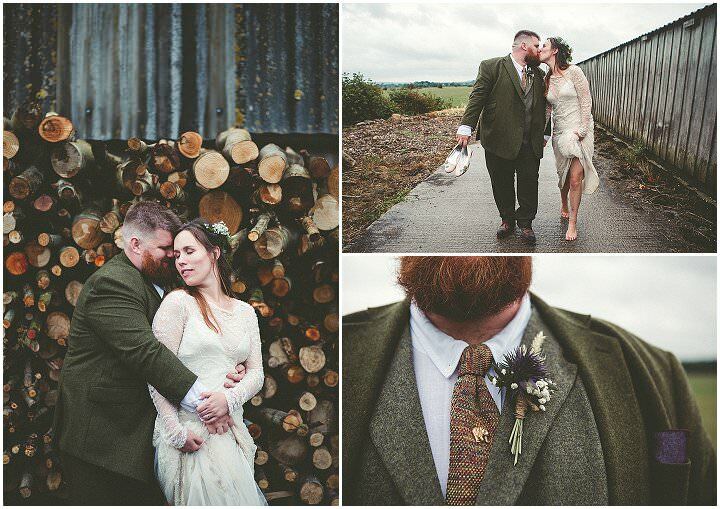 His tie was from The Tie Garden – a gorgeous Etsy shop which added that touch of Glasto quirkiness and he wore a bear lapel pin, a gift from me on the day – the bear is his spirit animal! I only had one Bridesmaid, Alice, because she is all I need! She wore a stunning lilac gown from Ghost London. 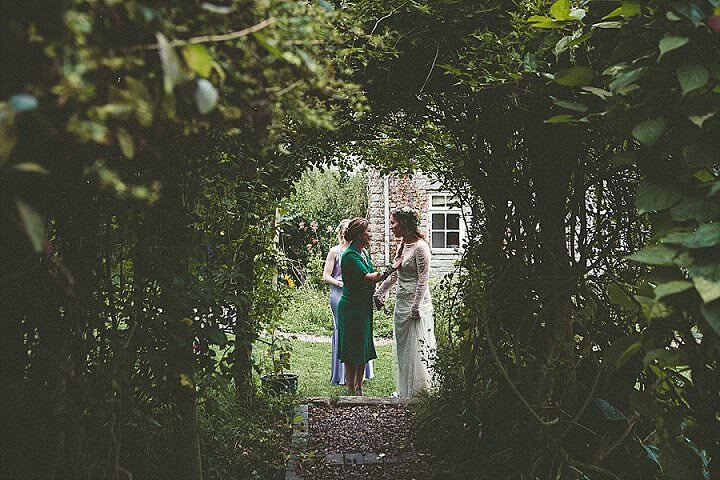 The theme was violet / lilac – representative of the Great Goddess and Lady of Avalon against differing shades of green – Adam’s Mum, Clare wore a bespoke sage green gown and my mum, Rebecca – who gave me away – wore a gorgeous green dress from Pretty Eccentric, a Brighton-based online boutique. The green represents the forces of nature and for the chaps, the presence of the Green Man. 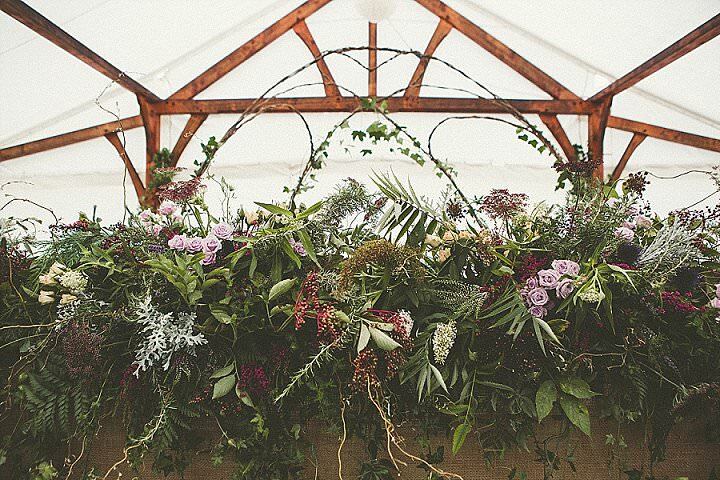 Our flowers were by the absolutely magical Creativity by Nina Jane. She had me astounded on the day with such rich textures and colours. I had said from the early planning stages, some two years ago, that as a ‘hedgewitch’ the flowers were one of the most important aspects of the day. 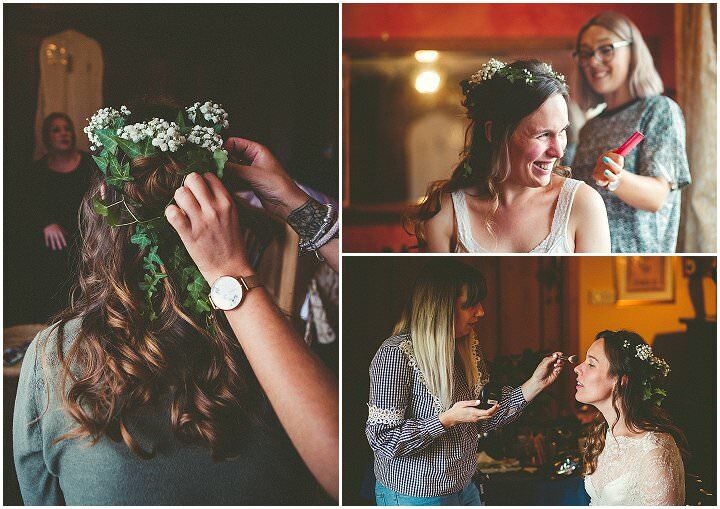 We worked together meticulously choosing which flowers would feature and their unique symbolisms. 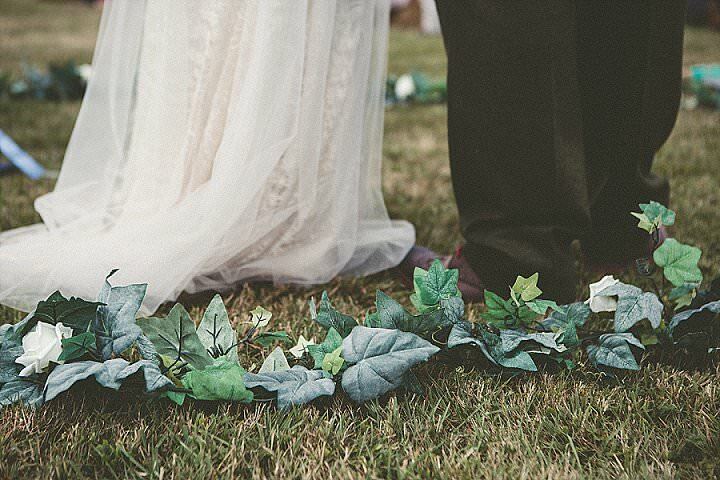 Ivy – to bind, thistles for hardiness and stoicism, Chablis roses for everlasting love. The roses were important, my Grandmothers’ maiden name was rose and it is also my middle name. 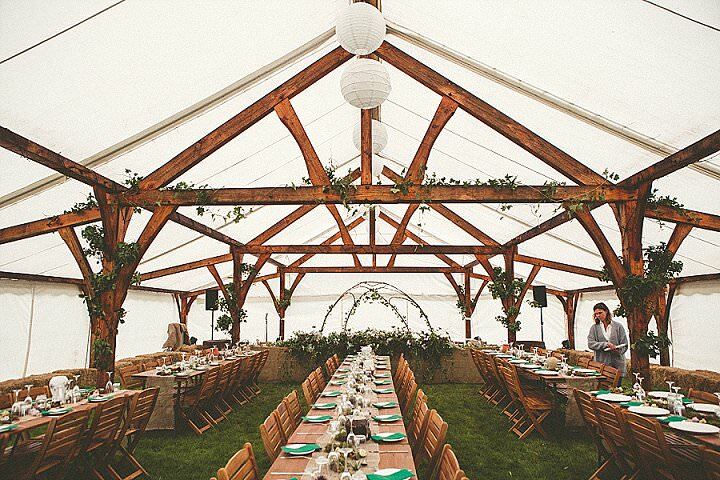 The top table was to be a showstopper – we wanted it to look like a wild forest or a Viking bower. 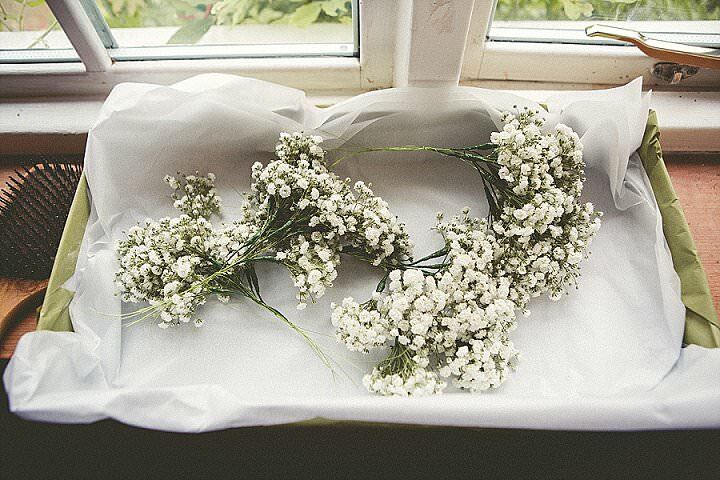 It was resplendent – chockful of rosemary, fresh mint, mountain heathers, ferns, elderberries, passionflowers, ivy, gyp, roses and grasses. It smelled divine. We had a huge barrel with our gorgeous cake on it, a wheatsheaf pentagram, in honour of it being the First Harvest festival – or Lammas. 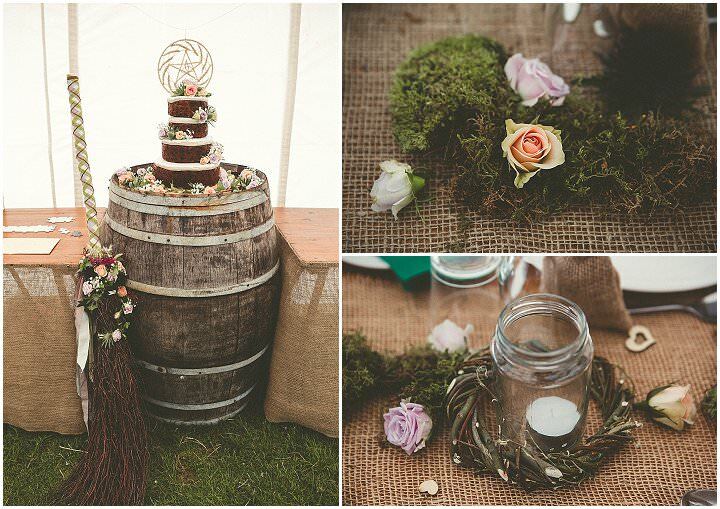 The tables were decorated with patches of moss and cut flowers. 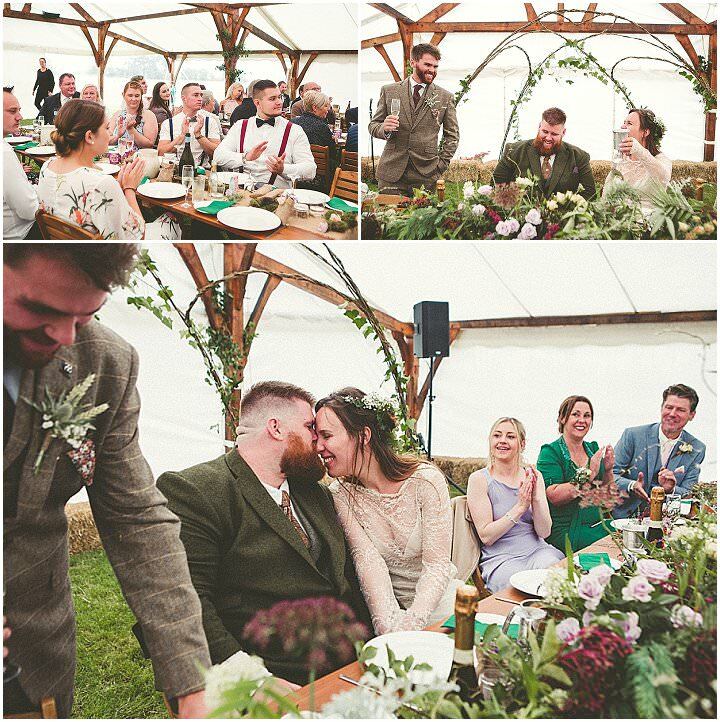 We had wooden swords and wands for the kids to play with and a wonderful willow frame arch at the back of marquee behind the top table which was seamed with ivy. 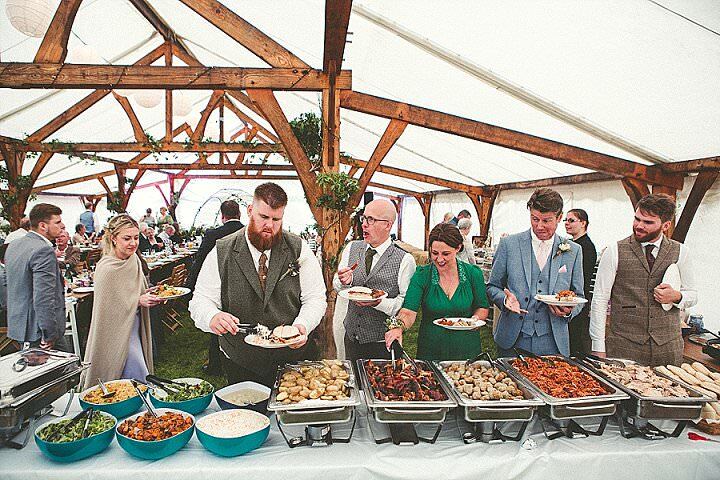 For the meat-eaters, we had hog roast and plenty of sides – potatoes, salad, greens from a company called Oaktop Hogroast. The veggies had frittata and there was a big pot of curry for our Vegan friends. The food was plentiful – we did not want anyone to go home hungry. Later that evening we laid on stone-baked pizzas for our guests. 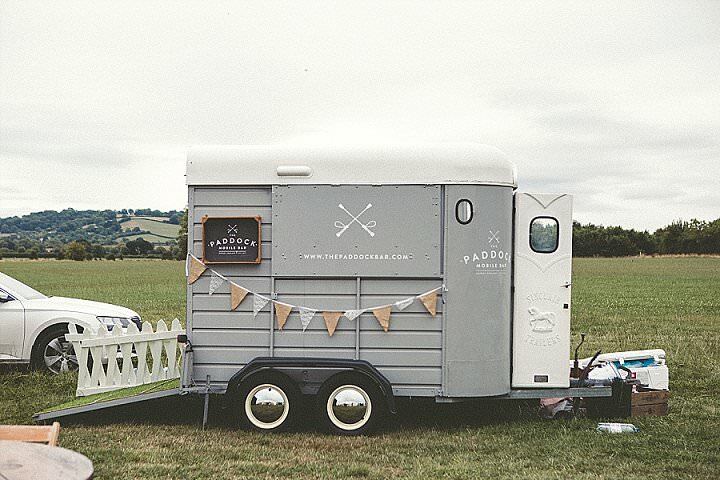 I want to mention our bar who were also amazing – The Paddock Mobile Bar – such a cool concept and everyone got suitably ‘merry’. We were very lucky to have my stepdad, Rich and his mum, Dee bake our cake which was an amazing rich fruit cake – one layer soaked in brandy, the other in whisky. 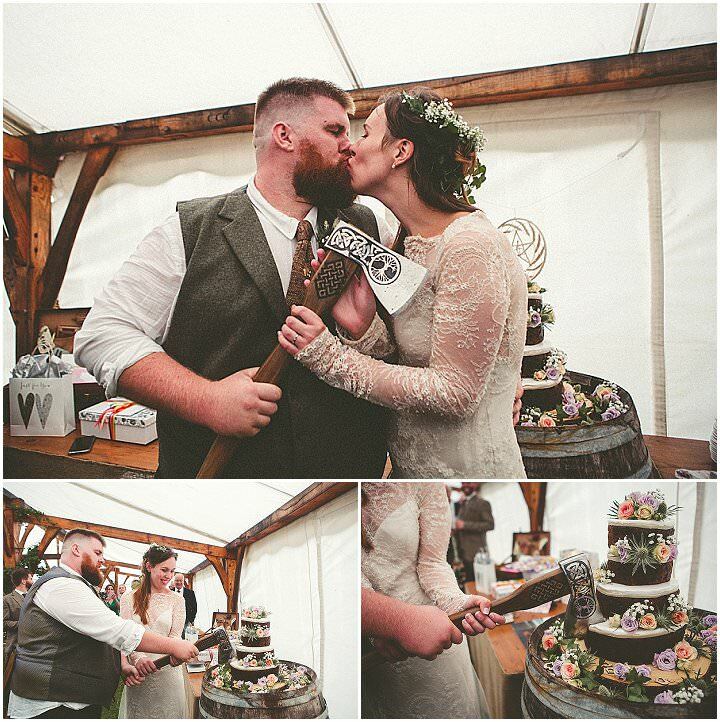 Adam also cut our cake with an axe! He’s such a Viking it’s unreal. Nina, our florist, then adorned the cake with flowers. My family are very musical so we were all playing instruments throughout the day. 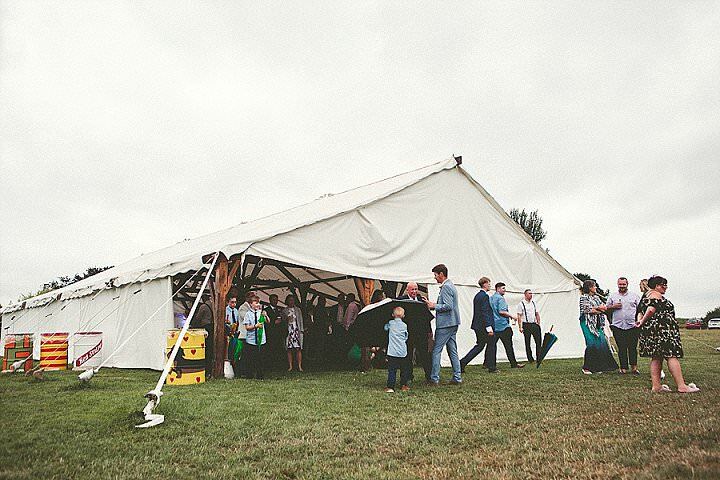 Rather than a tacky disco where the DJ chooses for you, we had access to the sound-system and had meticulously made our own playlist for the whole day with some classic songs and amazing anthems for all ages which kept us dancing into the early hours. It was all very ‘homegrown’. 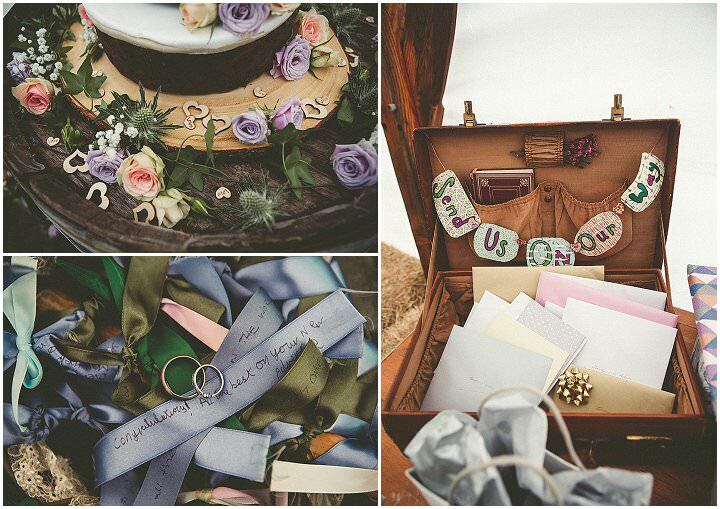 Paper Pleasures is run by a very passionate lady from the Isle of Man who makes gorgeous, unique wedding stationary. Most of it! 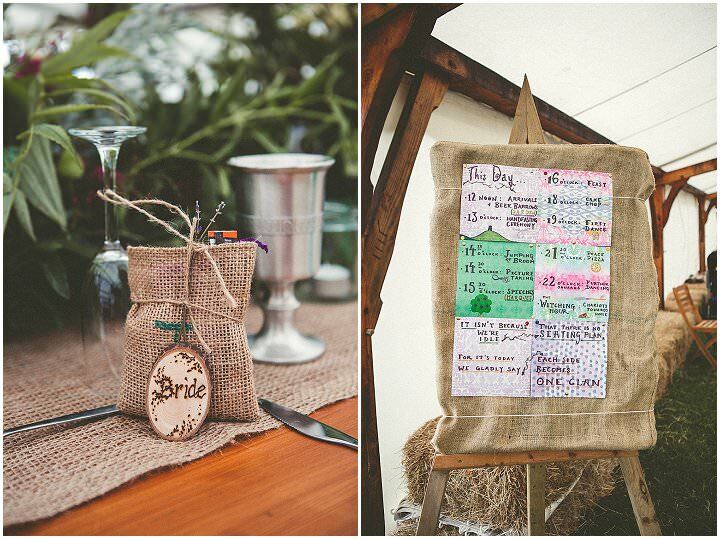 We didn’t have a wedding planner – it was all us. We had little favours on the table with a hangover kit – tea, soaps and little Wiccan charms, broomsticks, hats, pumpkins etc. We also placed a puzzle piece in each one which when put together by our guests, made up a photo of us on our engagement shoot. I wasn’t sure everyone would complete the puzzle but they did, it was perfect! Some of our loved ones even signed the back of their piece. 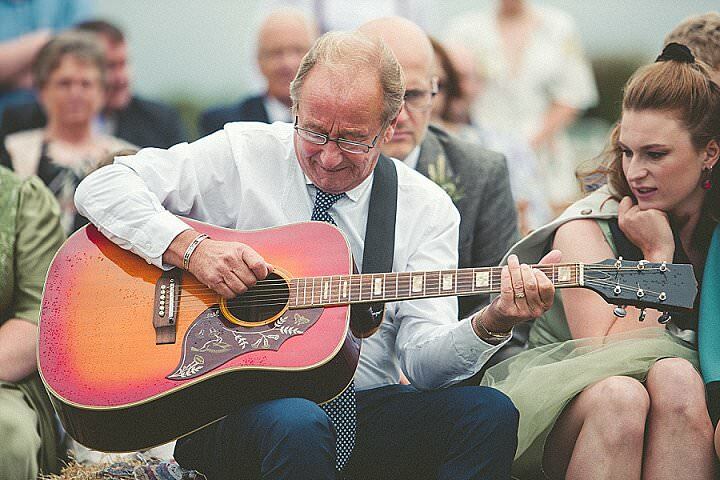 My gramps played a song he wrote for me on guitar at our ceremony and also at the reception. My mum gave a beautiful speech and so did Edd, Adam’s best man. 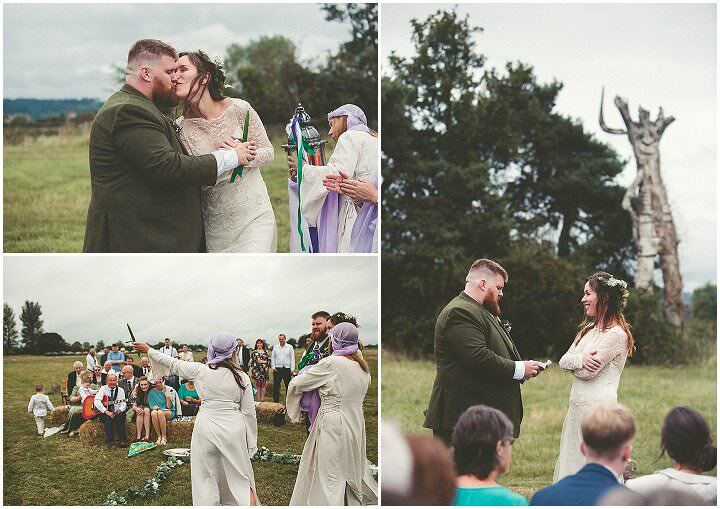 The ceremony was weaved beautifully by Dawn Kinsella of Sacred Celebrants Academy, who took everything we wanted and added new meaning to it. 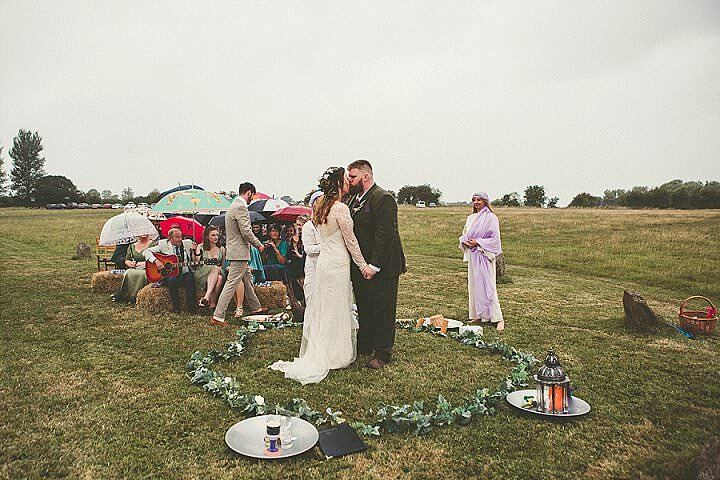 With a Sacred Celebrant as opposed to a regular ‘straight celebrant’ you weave your energies and build a relationship over a matter of months / years to compose your ceremony. Everything is personal, down to the beautiful chalice she creates with her ceramist, to the way each of the elements and their symbols is invoked. Truly a magical experience. 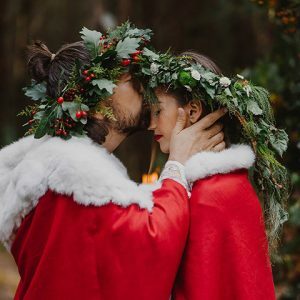 Dawn now even trains ‘straight’ celebrants in the art of Handfasting and Pagan Practice because of the increasing demand for something different. Highlights include first setting eyes on each other, as Adam stood in the stone circle and I approached. It was a mystical moment. We just fell in love all over again. Having all of our lovely guests and family / friends coming up to tie an individual ribbon around our hands and ‘hoop and wand’ was also such a wonderful moment. The speeches were amazing. 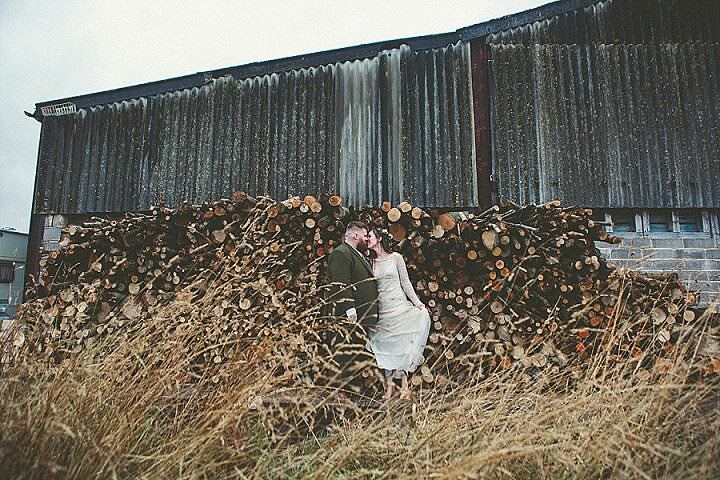 Our first dance was to the song ‘Cub’ by Roo Panes. We even managed to perfect a shoulder lift like the one in the new version of Disney’s Beauty and the Beast! All that practice paid off – and we are definitely not dancers, so a little bit of effort really helps. Things will go wrong, it sounds awful but if they don’t go awry then you are Goddess-blessed or something. 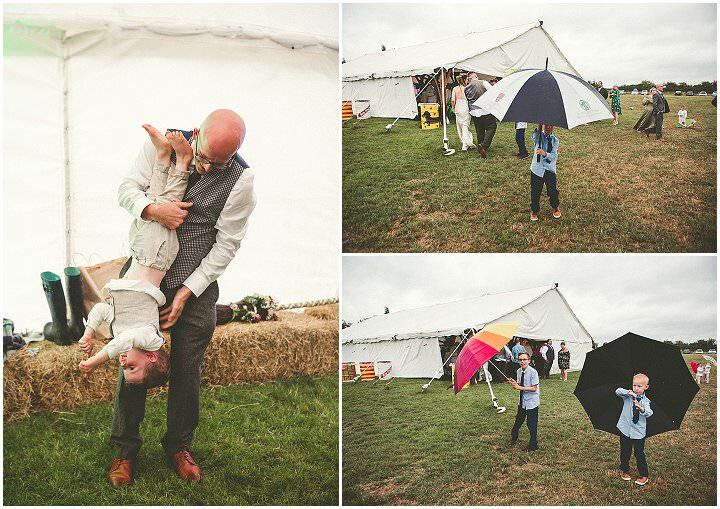 There was a good glug of rain on our day, which didn’t really bother us but isn’t everyone’s cup of tea – rain is cleansing! I was meant to have a local fiddle player on the day play as I travelled to the circle. It had always been my dream. On the day, he called Adam about half an hour before the ceremony saying he had stage fright and couldn’t make it. In the end, when you look back on those memories, none of these hiccups matter in the slightest. It was wonderful and the minute we saw each other we knew it was all going to be alright. My gramps had recorded the song he wrote for me, something he had been talking about for years and played it during the speeches. I was in pieces, it was wonderful. Adam’s speeches were gorgeous and I was so proud of him – we’re chalk and cheese where words are concerned, I love writing and creating and he is more practical. He floored me, however! It was ace.